Elementary age students bring lots of things to school with them -- besides huge backpacks stuffed with supplies. They bring ingenuity, intuitive knowledge, and mathematical insight. They sometimes amaze their teachers with innovative ways to solve problems. When mathematics teachers link their classroom instruction to students’ intuitive knowledge, students can take classroom instruction a lot farther. Tapping and nurturing that ingenuity and intuition is the idea behind Cognitively Guided Instruction. CGI is an elementary-level mathematics professional development program developed by education professors at the Wisconsin Center for Ed. Research. In a typical CGI math problem young students are presented with a problem like this: Robin has $5. How many more dollars does she have to save to have enough money to buy a puppy that costs $12? 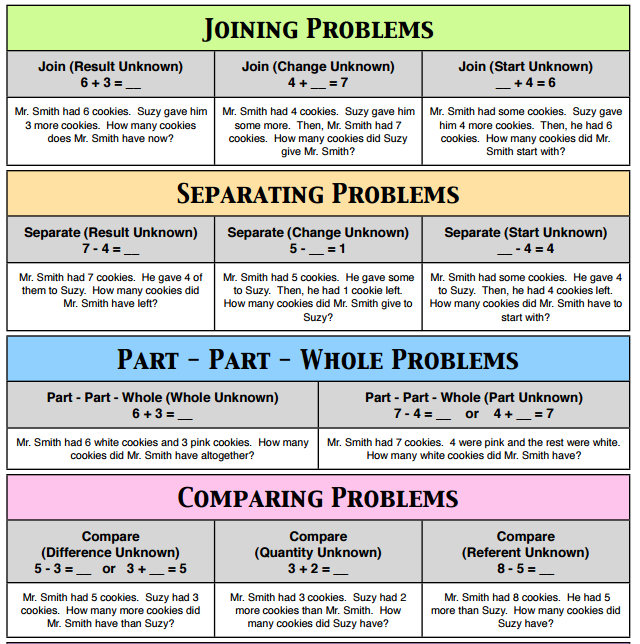 The teacher asks students to think about ways to solve the problem. A variety of student-generated strategies are used to solve this problem such as using plastic cubes to model the problem, counting on fingers and using knowledge of number facts to figure out the answer. The teacher then asks the students to explain their reasoning process. They share their explanations with the class. The teacher may ask the children to compare different strategies. Children are expected to explain and justify their strategies, and the children, along with the teacher, take responsibility for deciding whether a strategy that is presented is correct. Rather than simply being asked to apply a formula to several virtually identical math problems, students are challenged to find their own solutions. Second, they are expected to publicly explain and justify their reasoning to their friends and the teacher. Third, teachers are required to open up their instruction to students’ original ideas, and to guide each student according to his or her own developmental level and turn of reasoning. Expecting students to solve problems with strategies that haven’t been taught to them and asking students to explain and justify their thinking has a major impact on students’ learning. Not only are students’ learning specific ways to solve problem, they are also increasing their knowledge of the fundamental principles of mathematics. For example, students who learn the standard addition algorithm often learn little more than a procedure to find the correct answer. Students who develop their own strategies to solve addition problems are likely to intuitively use the commutative and associative properties of addition in their strategies. Student using their own strategies to solve problems and justifying these strategies also contributes to a positive disposition toward learning mathematics. CGI is based on research that shows that children come to school with rich informal systems of mathematical knowledge and problem-solving strategies that can serve as a basis for learning mathematics with understanding. A major goal of CGI is to help teachers build on this informal mathematical knowledge so that they understand the new ideas that they are learning. Because this method of teaching is innovative, CGI offers classroom teachers help in understanding how children’s mathematical ideas develop. The focus is on children’s thinking, not on specifying specific teaching procedures or curriculum materials.